Roast up a selection of your favourite vegetables and layer them with a delicious tomato sauce in this simple Roasted Vegetable Lasagne. Add the olive oil to a pan heat and add the onion and cook for 5 minutes. Add the garlic, tomatoes, basil and salt and pepper and simmer for 20 minutes. 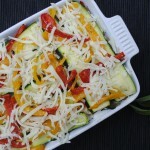 Put the vegetables on a baking tray and put in the oven at 200C/390F for 30 minutes. Once the sauce and vegetables are cooked, it is time to start making the lasagne. Take a 10inch x 6inch dish and add some of the tomato sauce to the bottom. Top with 3 lasagne sheets and then spread half of the ricotta on top of the sheets. The next layer is half of the roasted vegetables. Repeat this by adding some tomato sauce, then the rest of the lasagne sheets, the remaining ricotta and finishing with the rest of the roasted vegetables. Top with the shredded mozzarella. Put back in the oven and cook for 30 minutes.